Peel and cut the potatoes into medium-sized chunks. Add enough water and a tablespoon of salt to a large pot. When the water comes to a boil, cook the potatoes over medium high heat for 15 to 20 minutes or until tender. Once the potatoes are cooked, strain the water. Add the butter and nutmeg. Mash potatoes until they fall apart and let them cool. Once the purée is cold, add the flour and combine gently and thoroughly, but don’t knead it so the dough doesn’t come out too elastic. Divide the dough into 4 or 6 portions and form ropes using your previously floured hands. Cut the ropes into small chunks. Shape each gnocchi by gently pressing against the inside of a fork with your thumb. Put enough water and a tablespoon of salt in a pot and boil. When it comes to a boil, add the gnocchi and cook. Once the gnocchi floats to the top, wait one minute and it’s ready. Strain and serve with tomato sauce for pasta. 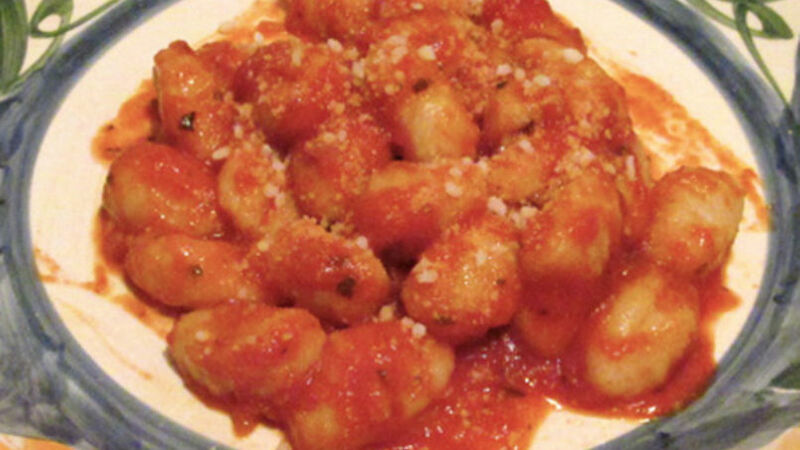 You may serve the gnocchi with your favorite sauce. When I arrived in the United States, one of the things I missed most was the food from my country, especially the food that my mom used to make. Upon noticing my feelings of nostalgia, an Argentinian friend taught me how to make from scratch one of my favorite dishes that my mom used to make for me: homemade gnocchi. I remember the day we made it; it was snowing out and we got together with my friend and her kids to scatter flour everywhere, while we laughed and drank ‘mate’. Gnocchi is easy to make, even though it takes some time, but it is a lot of fun to make with the kids. Culinary experiences are family moments that turn into unforgettable memories, strengthening bonds and offering an identity through culinary culture. I hope you decide to prepare this recipe - one of my mom’s specialties - which obviously has the Italian seal, a feature of most of the traditional recipes from my native country.